The silver Pavilion with a unique dry sand garden, located at the end of the path of philosophy. Jisho-ji Temple, located at the foot of Higashiyama mountains in Kyoto, is better known as Ginkaku-ji, the Silver Pavilion. Ginkaku-ji Temple was built as a retirement villa for the Shogun Ashikaga Yoshimasa in 1482, modeled on his grandfather’s villa, famed Kinkaku-ji Temple, the golden Pavilion and the villa was converted into a Zen temple after his death in 1490. Now It belongs to the Rinzai Zen sect. Despite its name, the Silver Pavilion was never plated with silver. It is said that the name appear as a nickname to contrast it with the Golden Pavilion. Instead, it is explained that the Temple’s dark exterior appear silvery by the moon light reflection. Shogun Yoshimasa obsessed the arts very much including the tea ceremony. The Togu-do building has a tea ceremony room which is believed to have become the prototype for all future tea ceremony rooms. Behind the Togu-do is a fresh-water stream where he ladled water for his tea. Ginkaku-ji became a center of contemporary culture, known as the Higashiyama Culture, developed and refined the tea ceremony, flower arrangement, noh theater, poetry, garden design and architecture during the period. The Silver Pavilion can be seen shorty after entering the grounds. The pavilion is constructed in two different architecture styles between first and second story and contains a statue of Kannon, the Buddhist goddess of mercy. Today, Ginkaku-ji has the Silver Pavilion and, 6 other temple buildings, a beautiful moss garden, which features ponds with islands and bridges, little streams and various plants and a unique dry sand garden, known as the “Sea of Silver Sand”, with a massive sand cone named “Moon Viewing Platform”. Visitors can enjoy walking the path along a circular route around its grounds, and catch glimpses of the Pavilion and gardens from different points. 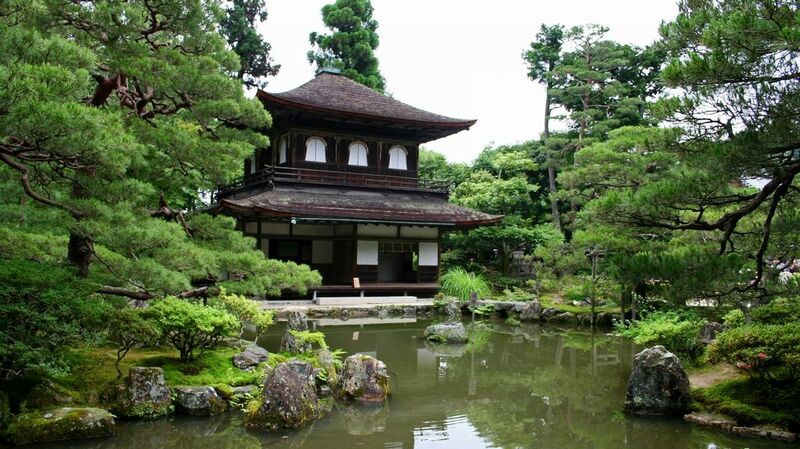 Bus : Ginkaku-ji can be reached by direct bus number 5, 17 or 100 from JR Kyoto Station. You can reach Ginkaku-ji by foot along the Path of philosophy from Nanzen-ji Temple in about 30-45 minutes. The Path of Philosophy is a pleasant path through the northern part of Higashiyama district. Named after famed Kyoto University professor of philosophy Nishida Kitaro’s daily habit of composing himself with a stroll along the canal path, the Path of Philosophy (Tetsugaku no michi) is a very pleasant and easy two-kilometre path that stretches from Eikando temple in the south to Ginkaku-ji (the Silver Pavilion) in the north. ← Mt. Kongo/ Osaka has the mountain and snow!